I wrote to you last month that I had been chosen at my workplace to go for a conference in America. I was the first to be chosen to attend such in my region. I wrote to you about it and you replied that you had prayed for me, and that God would favour me. I first went to the US embassy and was denied. I was so confused! God being so good, I met you at the airport two days to the start of the program. I walked straight to you and told you about it. You held my hand in the open and said a short prayer for me and told me it was done. I believed that prayer so much! Amazingly, the next day, I had a call from the US embassy to come. I was given a VIP treatment by the consular immediately I got there. He asked me very few questions and asked me to come the next day for my visa. What surprises me is that, I was asked concerning my 1 year 5 months old son. He was concerned whom I was going to leave him with, but I assured him my mum would take care of him. There and then, he gave me another form to fill. 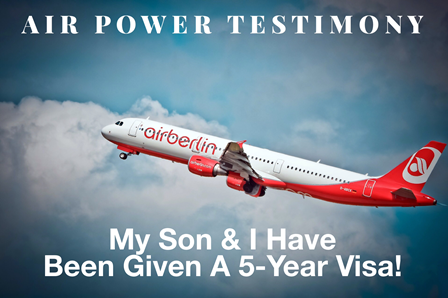 I picked up my passport the next day, opened it and found out that my son and I had been given a 5–year visa each. I am so grateful to God and to you. God bless you and expand your ministry! ﻿I Am 15 Weeks Pregnant! Wife Healed of Ovarian Cyst!